Abstract:Discontinuous (or split) nominal and prepositional constructions are extremely productive in Ukrainian. In split constructions, the head and the noun dependents are separated by lexical material which does not belong to the nominal or prepositional phrase. Ukrainian, like other Slavic languages, has free word order, a flexible intonation, and no obligatory articles—three properties that are decisive for the emergence of split constructions. The paper focuses on the role played by information-structure and intonation. A distinction is made between cohesive intonation, in which both parts of the split construction are uttered in a single intonation phrase, and non-cohesive intonation, in which the two parts of the splits are in separate intonation phrases. A cohesive intonation favors so-called simple splits in which the order of the constituents is respected, whereas a non-cohesive intonation typically (but not necessarily) correlates with inverted splits, where the order of the constituents differs from the canonical one. Both types of splits are triggered by an asymmetric information-structure: the two parts of the discontinuous phrase are separated from each other because they bear different information-structural features, like topic, focus, and givenness. 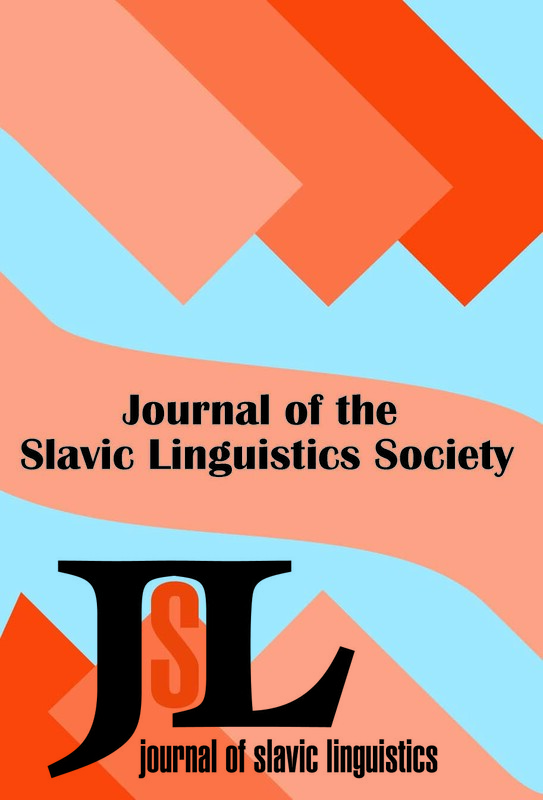 Abstract:The goal of this paper is to explore the properties of sluicing (i.e., clausal ellipsis) in Slavic languages. In turn, we will see how the Slavic data shed light on the nature of general processes underlying sluicing. First, I determine what positions wh-remnants occupy in sluicing constructions in Slavic, given the properties of wh--movement in each language. Contrary to the standard analyses, where an interrogative +wh- complementizer licenses TP-ellipsis, I argue that it is actually the +focus feature that is responsible for licensing sluicing in Slavic. The proposal is further extended to languages other than Slavic. I also demonstrate how the interpretation of multiple interrogatives in a given language affects the availability of multiple sluicing (i.e., sluicing with multiple wh--remnants) in that language. Finally, I explore a surprising manifestation of Superiority effects in sluicing structures in languages that do not exhibit Superiority effects in non-elliptical structures. I derive those Superiority effects from an independent property of ellipsis, namely, scope parallelism. Abstract:Lasnik (1998) observes that Russian lacks long-distance subject-to-object and subject-to-subject raising, where “long-distance” is understood in the sense of crossing the boundary of a clausal domain defined in terms of an independent Infl (Tense/Agreement) system. In Lasnik’s terms, this state of affairs arises because Russian infinitival clauses are necessarily Tensed, whereas English infinitivals (which do allow long-distance raising) may appear “tenseless.” In this article I discuss examples of raising with aspectual and modal predicates in Russian, whose grammaticality appears to call into question the validity of Lasnik’s claim and show that raising in these contexts is in fact limited to a single TP domain. Realizing the monoclausal character of raising removes the apparent challenge to Lasnik’s generalization and reaffirms the radically “local” behavior of Russian in the domain of A-movement. Abstract: Bulgarian verbs that denote change of location divide the space of linear motion in specific ways. Otivam ‘go’, a source-and-path oriented verb (Fillmore 1983), entails movement away from a starting point along a path. Associated adverbs and PPs express its goal or purpose. Idvam (perfective dojda ) ‘come’, a path-and-goal oriented verb, entails movement along a path towards a goal at the speaker’s or listener’s location (deictic center). Zaminavam and trâgvam , both glossed as ‘leave’, are source-oriented verbs, which have movement away from starting point/source at departure time, t1, coded in their meaning. With zaminavam , t1 is extended to include preparation prior to departure, while with trâgvam it is not. Xodja and vârvja , roughly ‘walk’, are path-oriented verbs denoting the homogenous activity of traversing a path. Both can refer to movement on foot, but normally only vârvja can refer to movement of vehicles. Pristigam ‘arrive’ is a goal-oriented verb which entails arrival at the goal, often at specific arrival time, t2. Elements of motion not coded in verbal meanings, e.g., the source of idvam , may be specified by PPs or AdvPs.